The last edition of Denim Premiere Vision held on 18 and 19 May 2016 in Barcelona, was pervaded by a busy and friendly atmosphere even if according to some exhibitors, attendance was slightly lower than what they perceived in previous editions. According to others they registered stable visits, even if they felt that too many denim shows are happening in a very short time span and that this may be slowing down general attendance. Despite different opinions, one aspect is for sure: The show presented many novelties in terms of trends, technology and eco-friendly developments. The f/w 2017-18 season seems to present ideas that may create a new course and a change of perspective for jeans and casualwear in the future. 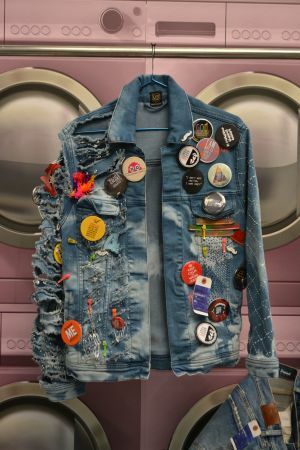 In collaboration with Jeanologia and denim guru François Girbaud, Denim Premiere Vision hosted Hemotion, an exhibition showing how important jeans hems might become in the future thanks to jeans with a new hem design, silhouette, cutting, fringing and decorating. The art of designing new stretch jeans is becoming ever more sophisticated. Calik presented newly developed denims that fit one’s body without any surface crease, have perfect recovery and flatter one’s figure with a one-size-less effect thanks to a collaboration with Invista's Lycra. ...or is the future stretchless? Many companies are also focusing on denims with stretch only in warp, the vertical part of the weave, therefore adding comfort while making trousers look less second-skin-like than in the last seasons. Naveena, Pakistani denim specialist, started a collaboration with François Girbaud who defined how jeans silhouettes can evolve through his NDL (Note De L’Auteur) initiative. “The future of denim? Athleisure is not the answer. Creating jeans that look like training pants is not adding much to this market. Supertight ‘camel-toe’ like jeans are too much now,” said Girbaud. “The future can be rather a new look that everyone can wear and that can adapt to any body type,” he explained while presenting highly constructed women’s flare trousers that can be completed with inner paddings on the back and are perfect for being worn in every context from formal to everyday. Orta focused on a series of fabrics dedicated to be worn in a future world populated by denim clad nomads wearing highly functional, ergonomic and multipurpose sportswear pieces, projected in a sort of intergalactic sci-fi world, designed by The Vintage Showroom expert consultants and employing blue hue, grey, brown and military green denims. As modern life is getting tougher also denim has to become more and more protective, though also more focused on soft touch aspects. For instance, Soorty launched its Armadura fabric in collaboration with Dyneema, a new sturdy denim with a soft feel. Artistic Milliner focused on a selection of smart fabrics including denims that incorporate Thermolite IR technology that can help warming up the wearer when body temperature lowers. Other fabrics incorporate Cordura (high abrasion resistant fiber) and Tencel (supersoft touch fiber) at the same time which creates a synthesis between top protection and coziness. Odo debuted at this show’s edition launching a self-cleaning fabric that literally doesn’t need to be washed because it is treated with a stain-repellent technology and doesn’t smell because it is treated with a silver odorless technology. Great attention continues to be devoted to wool-like and warm touch denim. Prosperity launched their new cashmere touch denims made by mixing cotton and Tencel. Toray presented Naturaluxe, a fluffy and soft fabric that is made with cotton but is as soft as wool, and Thermobank, a warming effect functional fabric. The hype of natural materials and eco-friendliness continues to characterize various denim collections. US Denim has launched Spider Silk Jeans, a new denim that contains 2% of real spider silk, a highly-resistant fiber with anti-microbial and anti-fungal properties. Bossa has reinforced its Re-Set selection of sustainable denims. They introduced stretch selvedge fabrics made with organic cotton. Other Re-Set fabrics are dyed with 100% vegetal extracts from pomegranate for beige and slightly brown shades. They also employed recycled grinded coffee grains for treating their fabrics in order to obtain anti-odor and faster drying fabrics. They also coated denim with lanolin, a natural origin oil through which denim gets a more intense blue hue and a very soft hand. Tavex has presented its T-Care selection of sustainable denims employing their Aquasave and Easy-Laser technology through which they save 100% water. For this family of products they employ BCI cotton. Referring to their total denim production they are quite virtuous: 50% of the cotton they employ is BCI cotton. Baykanlar, Turkish garment manufacturer, has launched Indigo Rehab, a selection of garments that are made with organic fabrics and according to sustainable criteria. In order to cut COD (Chemical Oxygen Demand), Prosperity Textile has introduced a new dyeing additive instead of sodium hydrosulfite, which provides a new blue shade and uses 60% less COD than most widespread treating technology. Also Kipas has started employing two ecofriendly fibers by the Italian fiber manufacturer Fulgar (see separate story).